Italian dessert recipes or any dessert recipe is the reason we eat. If there is no dessert, then why have the meal in the first place. You need to set a goal during dinner and that goal is dessert. Now that the holidays are over and everybody put on a few extra pounds we should be cutting back on our desserts. I've never found that to be a legitimate reason. Cut back on something else but not my desserts. Indulge yourself on some of the finest Italian dessert recipes I have to offer. 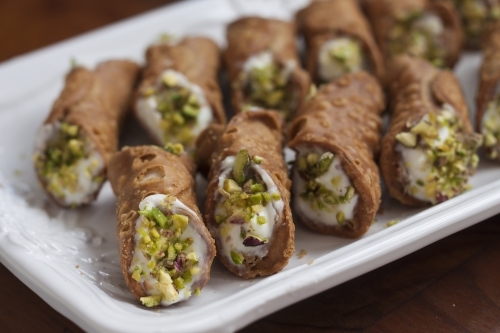 From a delicate zabaglione to a decadent chocolate covered cannoli. You'll find yourself willing to risk those few extra pounds just to enjoy these Italian favorites. Bathe in the chocolate and bask in the custard. Also, let's not forget the biscotti and the tiramisu and the cakes and the cookies. So get on board and let's discover the sinful pleasure of Italian desserts. Melt in your mouth cannoli topped with semi-sweet chocolate. This traditional Italian classic dessert will leave a lasting impression on yourself and your guests. Light easy to make custard made with sweet Marsala wine. Creamy rich gelato in four delicious flavors. A delicious new dessert for you to love. Delicious cheesecake for the entire family or for yourself. Crisp pastries filled with custard and sprincked with powdered sugar. Sicilian cake filled with ricotta and topped with frosting, candied fruits and nuts. Light flaky cookies dusted with powdered sugar. A light, airy, lemony dessert. Rich chocolaty ice cream treat. Light, crisp waffle like cookies dusted with powdered sugar. Light flakey pastry stuffed with sweetened ricotta cheese and candied fruit. A a chocolaty rich, easy to make dessert I’m sure you’ll enjoy. Sweet and creamy Italian dessert. Fresh strawberries marinated in red wine and sugar. Delicious crunchy chocolate and hazelnut. Rich and creamy chocolate mousse made with rum and espresso. Sweet gooey Neapolitan holiday treats. Light creamy dessert topped with berries. Discover great recipes for tasty chocolate treats. Visit Everyone-loves-chocolate.com for some delicious chocolate recipes. Try all of these recipes for your cooking and baking pleasure and get rave reviews from others when they taste your creations.